Even if your writing is of a “cut and dry” nature, you never know when you’ll be called upon to engage in some rapid-fire, innovative brainstorming. Perhaps your editor is searching for a different method of formatting data; or maybe you have been called upon to redesign an outdated cataloguing technique. 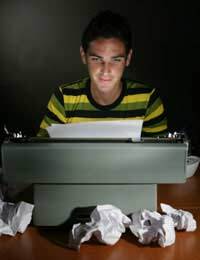 Even technical writers or those who are “hard journalists” have moments of writer’s block. Yes, the elements of their texts might essentially be of a “black and white” nature, but that doesn’t make it easier when the brain decides to go on hiatus. When fuzziness engulfs the mind, switching tasks to those that are more creative could be the ideal key to getting back on track. The next time you’re feeling uninspired or completely worn down, take a few moments to describe a colour (it’s not at easy as it sounds), create a children’s fable, or just invent a new joke. As a writer of any kind, you can always use more word knowledge. And when you’re writing creatively, you will undoubtedly stumble across new terms and phrases (and possibly even invent a few of your own!). Such finds can only serve to make you a better all-around author and conversationalist. So pick up your pen and begin thinking of all the words that are synonymous with “good” (and look some up, too). If you’ve never tried creative writing before, you might feel a little hesitant at first, assuming that it’s somehow out of your reach. But what you’ll soon come to realise is that being imaginative isn’t a science… it’s an art and it’s learnable. By opening yourself up to new worlds, you will likely discover that you have abilities you never would have suspected. Perhaps a children’s book will emerge from your creative musings, or maybe you’ll shine in the area of greeting card writing! Who knows what talents lie buried in your soul? Once you let them out, it can be an amazingly freeing experience which can lead to a boost of self-esteem and accomplishment. Finally, it’s just plain, old fashioned fun to allow yourself to do something different. As adults, men and women tend to become stuck in “ruts”. Unfortunately, many never try to escape from these self-created prisons and may actually begin to feel resentful and discouraged. When you introduce creative writing into your life (even if for only a few moments a day), you can reap the rewards of enabling your spirit to fly with a bit more freedom. Then, when you return to your daily tasks and family, you will carry with you a positivity that will no doubt become infectious! Who knows? You might just entice the rest of your household or office to begin creative writing for fun, too.